Earlier this week Blair, my mom, and I had a little fun in Atlanta! It was my mom's birthday, so we went out to my favorite place, Taquería del Sol. I was so hoping that mom would choose it for her birthday supper, and SHE DID! I didn't even say a word about it to even drop a hint! I should have taken pictures of my delicious fish and fried chicken tacos. The cracker chicken taco special was our favorite! So that was yummy, and then we stopped by an Italian restaurant on the way back to the house to get tiramisu for birthday dessert! Yum! 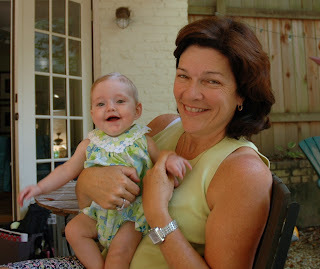 The birthday girl with her grandbaby! We had two appointments for Blair the next day. First we went to the Atlanta Speech School to meet with the early intervention specialist. She worked with Blair in her oh-so-neat home environment office. It was like walking into someone's house -- only in the middle of a school! She said that Blair hears very well and that we should continue to monitor her speech as we had planned to do. She gave me some things to do with Blair when we read or play. So that was a good meeting. She offered to do a distance type learning in which we would go to Atlanta once a month for her to work with Blair and evaluate her progress in language development. The assessment of the development of her language skills is very important, because it will tell us a lot more about the quality of what she hears, since AN is characterized by a distortion of sound. We also saw a pediatric otolaryngologist at Children's Healthcare of Atlanta. He has experience with AN. He also said to keep doing what we're doing, and he thought the once a month meetings with the early intervention specialist was a good idea. So that's where we stand on the hearing! Between all of that hearing stuff, Blair had her first mini playdate with Julia, my Furman friend Rebecca's daughter, who is just over a week younger than Blair. They were too cute! We quickly found out that Blair is NOT shy. She beamed at Julia like she does with her daddy, and she wanted to touch Julia all over her face and hold her hands! It was so cute! Blair is very excited to have a friend! Poor Julia's hair is getting messed up by little miss explorer. This is how Blair checks things out -- straight to mouth with Julia's hand. Julia liked Blair's bow. Blair just goes for anything she can get her hand on. Of course, I insisted on having an FO on the way home, so we zipped by the Varsity for some sho nuf greasy food. Thanks for making my birthday so special! I had such a good time!